Are Crickets Dispersing Seeds of Parasitic Plants? Parasitic plants lead a rather unique lifestyle. Many have foregone photosynthesis entirely by living off fungi or their photosynthetic neighbors. Indeed, there are many anatomical and physiological adaptations that are associated with making a living parasitically. Whether they are full parasites or only partial, one thing that many parasitic plants have in common are tiny, dust-like seeds. Their reduced size and thin seed coats are generally associated with wind dispersal, however, there are always exceptions to the rule. Recent evidence has demonstrated that a handful of parasitic plants have evolved in response to a rather unique seed dispersal agent - camel crickets. 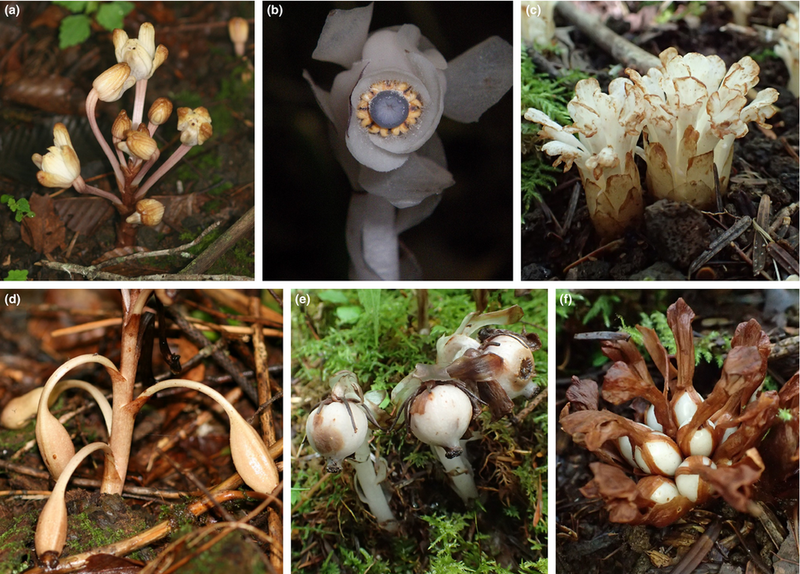 A research team based out of Japan recently published a paper describing a rather intriguing seed dispersal situation involving three species of parasitic plants (Yoania amagiensis - Orchidaceae, Monotropastrum humile - Ericaceae, and Phacellanthus tubiflorus - Orobanchaceae). These are all small, achlorophyllous herbs that either parasitize trees directly through their roots or they parasitize the mycorrhizal fungi associated with said trees. What's more, each of these species are largely inhabitants of the dense, shaded understory of rich forests. These sorts of habitats don't lend well to wind dispersal. The closed forest canopy and dense understory really limits wind flow. It would appear that these three plant species have found away around this issue. Each of these plants invest in surprisingly fleshy fruits for their parasitic lifestyle. Also, their seeds aren't as dusk-like as many of their relatives. They are actually quite fleshy. This is odd considering the thin margins many parasitic plants live on. Any sort of investment in costly tissues must have considerable benefits for the plants if they are to successfully get their genes into the next generation. Fleshy fruits like this are usually associated with a form of animal dispersal called endozoochory. Anyone that has ever found seed-laden bird poop understands how this process works. Still, simply getting an animal to eat your seeds isn't necesarly enough for successful dispersal. Seeds must survive their trip through the gut and come out the other end relatively in tact for the process to work. That is where a bit of close observation came into play. After hours of observation, the team found that the usual frugivorous suspects such as birds and small mammals showed little to no interest in the fruits of these parasites. Beetles were observed munching on the fruits a bit but the real attention was given by a group of stumpy-looking nocturnal insects collectively referred to as camel crickets. Again, eating the fruits is but one step in the process of successful seed dispersal. The real question was whether or not the seeds of these parasites survived their time inside either of these insect groups. To answer this question, the team employed feeding trials. They compared seed viability by offering up fruits to beetles and crickets both in the field and back in the lab. Whereas both groups of insects readily consumed the fruits and seeds, only the crickets appeared to offer the greatest chances of a seed surviving the process. Beetles never pooped out viable seeds. The strong mandibles of the beetles fatally damaged the seeds. This was not the case for the camel crickets. Instead, these nocturnal insects frequently pooped out tens to hundreds of healthy, viable seeds. Considering the distances the crickets can travel as well as their propensity for enjoying similar habitats as the plants, this stacks up to potentially be quite a beneficial interaction. The authors are sure to note that these results do not suggest that camel crickets are the sole seed dispersal agents for these plants. Still, the fact that they are effective at moving large amounts of seeds is tantalizing to say the least. Taken together with other evidence such as the fact that the fruits of these plants often give off a fermented odor, which is known to attract camel crickets, the fleshy nature of their fruits and seeds, and the fact that these plants present ripe seed capsules at or near the soil surface suggests that crickets (and potentially other insects) may very well be important factors in the reproductive ecology of these plants. Coupled with previous evidence of cricket seed dispersal, it would appear that this sort of relationship between plants and crickets is more widespread than we ever imagined. It is interesting to note that relatives of both the plants in this study and the camel crickets occur in both temperate and tropical habitats around the globe. We very well could be overlooking a considerable component of seed dispersal ecology via crickets. Certainly more work is needed.